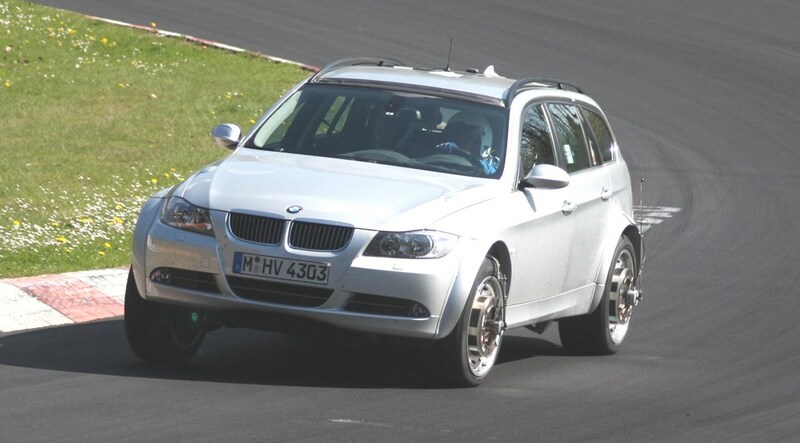 This is BMW’s latest X3 prototype, testing under the body of a humble 3-series Touring. CAR Online’s spies have snapped the next-gen SUV mule on its first outing at the Nurburgring. Set to go on sale late in 2010, the Mk2 BMW X3 will be the Bavarian company’s most driver-focused 4x4 yet; active steering, active roll compensation and an active rear diff will all be available. Is the new X3 any bigger than today's? The vital stats are 4650mm (length), 1850mm (width) and 1680mm (height), according to our sources. The width and height are pretty much as before, but the extra length is down to a longer wheelbase (up from 2795 to 2880mm), and the need to meet the latest crash regulations. To differentiate the X3 from the forthcoming X1 (bottom right in our pictures), the former’s styling will be upright and traditionally 4x4-esque. But if you want a sporty-looking X3 then be aware that BMW is also readying an X4. This coupe-SUV has been designed, but BMW is waiting to gauge reaction (and sales) of the X6 before committing to production. But even without the X4, BMW wants to sell 160,000 of the new X3 every year, according to internal documents seen by CAR Online. That’s a big jump from the 100k or so made today. BMW is making its Efficient Dynamics technology compatible with six-cylinder engines, so expect all X3s to come with stop/start, active aero and a decoupling alternator. Diesels will get DeNOx catalysts while ZF’s new eight-speed auto will be available. Further down the line, and not yet confirmed, is an X3 hybrid, using the same system BMW is developing with Mercedes, Chrysler and GM. BMW has just shown off its new active rear differential in the X6. Active diffs are nothing new, but BMW claims its system is the only one that can stabilise a car both under power and on the overrun. On the options list will be active steering (variable rate and self-acting yaw control) and active roll compensation, while adjustable dampers, electro-hydraulic brakes and an advanced decelerate-to-stop cruise control system are being lined up. The Mk2 X3 will finally see the arrival of iDrive, and BMW will further tweak the system to make it as easy to use as Audi’s MMI and Merc’s Comand system. The dashboard’s styling will be more driver-orientated this time around, while the X3 will also get the latest joystick gearstick and decent cabin materials, or so we're told. Production of the X3 will switch to BMW’s Spartanburg plant in South Carolina, and the weak dollar should mean even more profit for the bean counters. The next-gen Z4 will be built in Europe (it's currently made in the US) while the slack left in Magna-Steyr’s Austrian plant by the X3’s switch will be filled by the X1 and Mini SUV. Expect BMW X3 prices to start from £30k and sales in the UK from early 2011.